Here at Courthouse, we love a friendly competition between our Beaver & Duck fans! 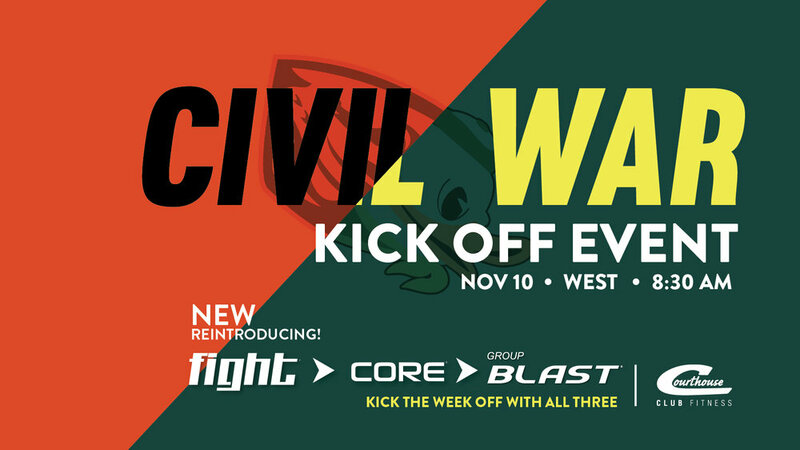 We’re celebrating the Civil War a little early while we bring our members new workouts, new music, and a NEW class! If you’ve been waiting for FIGHT to make a comeback, the time is now! Join us Saturday, November 10th as we kickoff a spirited week with a 30-minute preview of three great classes. Come to one, come to all . . . but make sure you come supporting your favorite team! Can’t make it Saturday? We’ll be celebrating from November 10th - November 16th with plenty of team spirit. This event if FREE for members. Non-Members may receive entry with a donation of canned or non-perishable food for Marion-Polk Foodshare.